Songket represents a luxurious hand woven silk or cotton textiles, intricately designed in traditional patterns with gold or silver threads to create a shimmering effect. It belongs to the heritage of Malaysia, Indonesia and Brunei and the term songket is derived from the word ‘sungkit’, which means ‘to hook’! The opulent textile is usually worn during special occasions and is made into traditional national costumes to represent its heritage. When I was invited to Songket, located deep downtown in Kuala Lumpur, I know to expect nothing but luxury and authentic Malay cuisine at its best! Barely few months old, the restaurant already is well known for its cuisine and traditional Malay cultural performances. 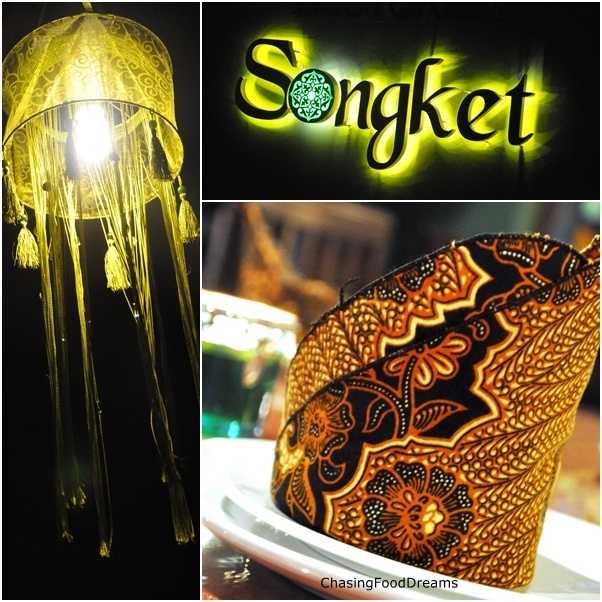 True to its name, Songket Restaurant serves authentic high quality Malay cuisine inspired by traditional Malay recipes made only with the freshest ingredients like the pieces of Songket textiles that decorates the place. While Malay restaurants aren’t new in the city, Songket Restaurant is a refreshing one – that blends traditional styles of cooking and entertainment with modern creativity in a relaxed, upscale environment. 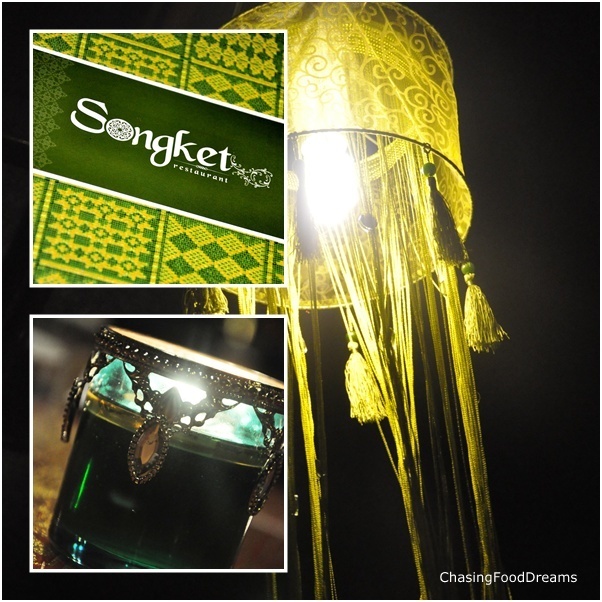 Songket’s unique décor includes beautiful and colorful Songket pieces, softly illuminated granite water feature and decorative hanging laterns. Tucked in a quiet cosy corner of Jalan Yap Kwan Seng, the bungalow has been converted to resemble a “kampung” (village) house. It has maximum seating capacity of 300 and is ideal for events and parties given its spacious environment and ample free parking. The restaurant has one gorgeous private dining room to accommodate up to 12 persons comfortably. This lovely purple Teddy Bear is made from songket. A brilliant idea to showcase our local songket designs! Chicken and Beef Satay (RM18) had eight skewers of lean chunks of meat well marinated in spices and honey. These were grilled flawlessly and served with ketupat and peanut sauce. I love the beef satay as it was tender and juicy with a nice balance of spices. Next up was Cucur Udang (RM10). 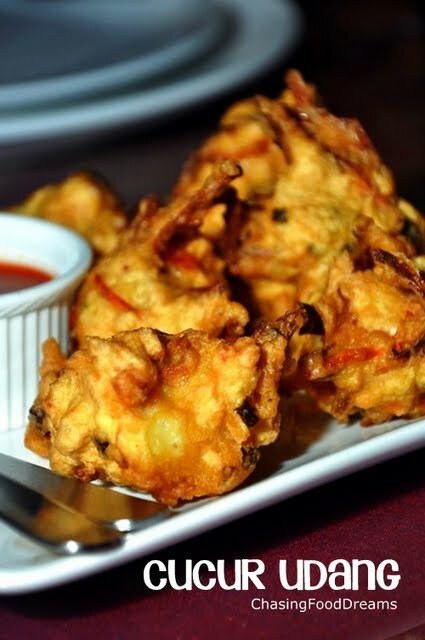 Lovely morsels of fried prawn fritter had a soft texture inside and filled with vegetables and prawn. Since I am a sucker for any fritters, needless to say I like this appetizer a lot. 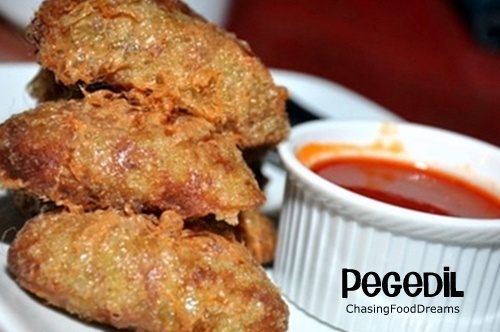 Pegedil (RM10) is fried patties of mashed potato with minced chicken. This is my favorite appetizer as the potatoes are creamy and beautifully spiced! We also enjoyed Otak Otak (RM12), a seafood mousse with kaduk leaf baked in a mug. At first look, it looks dry but when I tasted it, it was the complete opposite. 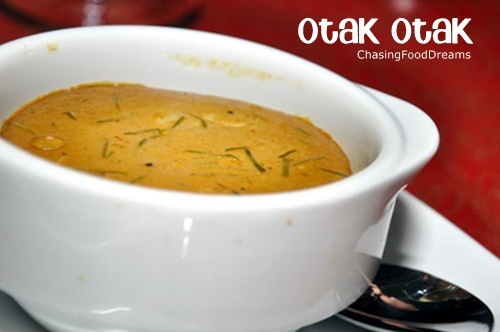 Very moist, creamy and luscious, the otak otak is fantastic with its bold spicy flavors. No sooner as we finished our appetizers, a lovely Kerabu Mangga (RM12) arrived. Young green mango was shredded and mixed with a spicy dressing. Intricate flavors and texture, the salad is so appetizing with rice. 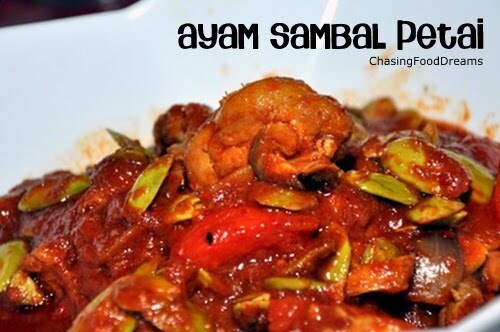 Ayam Sambal Petai (RM28) was fiery looking with its red hues or gravy dotted by green stinking beans. The dish had fried pieces of chicken simmering in a tomato chili sauce with petai. Flavors were gentle but tasty and it had just a nice hint of heat to it. 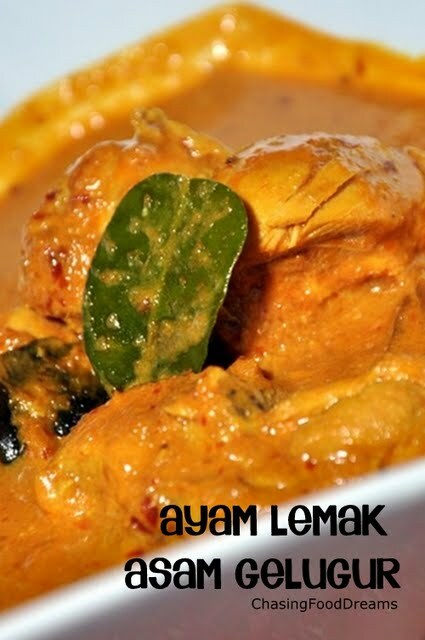 Another chicken dish of Ayam Lemak Asam Gelugur (RM23) had pieces of chook in lovely gravy of yellow tumeric, coconut milk, kaffir leaves and other spices. Echoing a thinner version of rendang, the curry was mild and creamy with the wonderful aroma of the kaffir leaves. Kari Udang Raja (RM75) had a few people ogling at the luscious king prawns with delight. The prawns were cooked in a rich curry of spices and had a creamy based due to the coconut milk. We also enjoyed Masak Lemak Udang Nanas (RM45). Succulent prawns and pineapple chunks are cooked in a light coconut milk spiced with tumeric and scented with kaffir leaves. The gravy was velvety, sweet and light and goes really well with the pineapple chunks. I sampled the Ikan Siakap Masam Manis (RM60) and decided that this shared a similarity with the Chinese sweet and sour sauce. There was a stronger hint of chili in the sauce and filled with lots of onions, tomatoes, curry leaves and chilies. 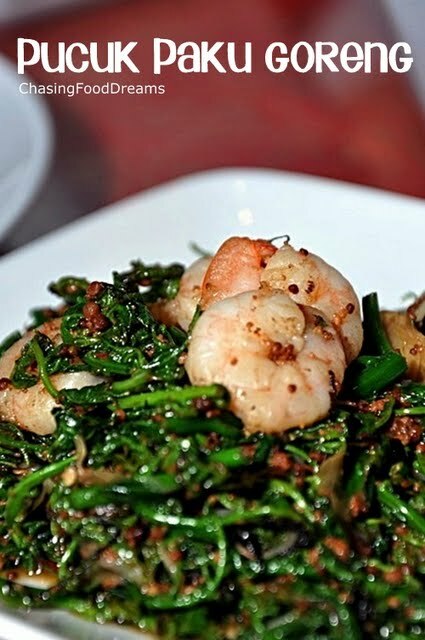 Pucuk Paku Goreng (RM15) was wild fern shoots stir fried with a blend of chili, shallots and garlic with prawns. We were served three types of rice that night. Pandan Nasi Lemak (RM6) had a light pale green tinge and was flavored with coconut and aromatic pandan leaves. Sambal with a mixed of peanuts and anchovies was served with this rice. Nasi Minyak (RM6) was fluffy spiced up rice served with a side of fruit acar. Nasi Kerabu (RM8) was rice tossed with mixed herbs and served with crispy crackers and a curry sauce. This was my nice platter with a bit of everything! Desserts were the black sheep in this whole affair. Thinking along the lines of simple and normal desserts, I was in awed when I tasted them! Pandan Pudding (RM10) was so luscious, I had to order one just for myself! One bite and you will be hooked like me. 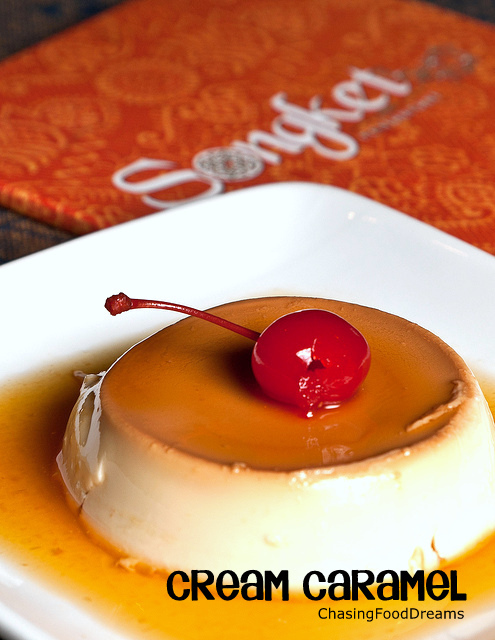 So luscious, creamy and fragrant, one bite of this magnificent pudding will make you want more! Trust me, one is Not enough!! Sago Gula Melaka (RM10) had a lovely wobbly texture and when doused with rich gula Melaka and coconut milk, this was delicious. I recommend dousing it with lots of gula Melaka for the heavenly taste. Durian Tiramisu (RM15) had another guest that night swooning with joy! She kept raving how sinful this dessert was. I’ll take her word for it as I am super allergic to durians…hehehe. Coconut Cream Caramel (RM10) was another lovely dessert but I prefer the Pandan Pudding. 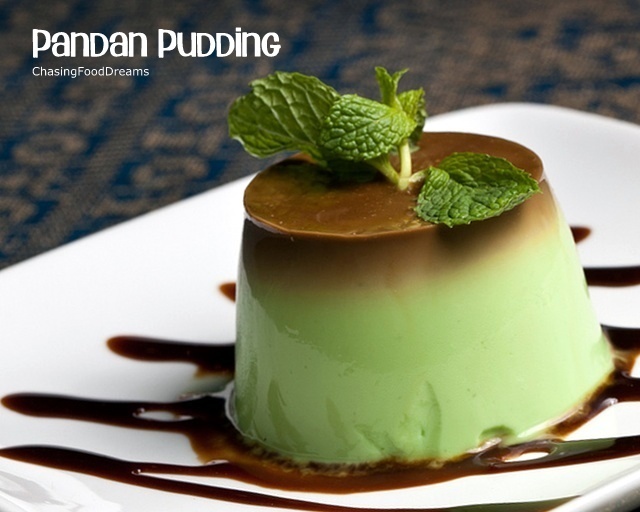 Take my word, order the Pandan Pudding! 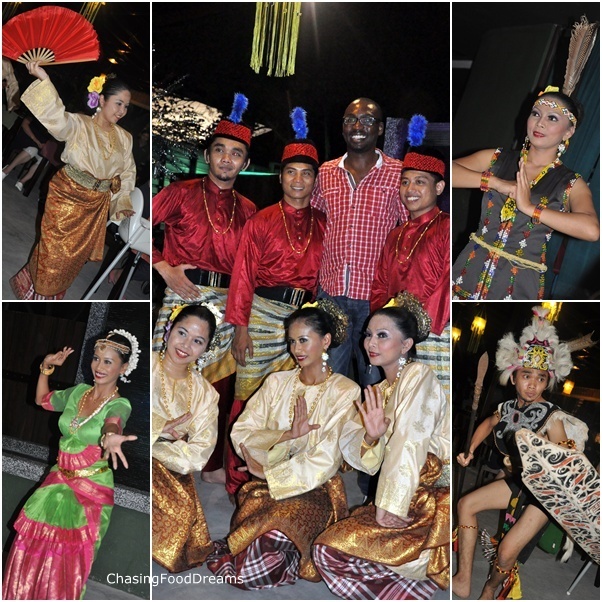 The management believes in providing a truly Malaysian experience, therefore, nightly performance of traditional cultural entertainment is showcase every week day from 9pm onwards. Songket certainly lives up to its name! The restaurant is a class of its own league. Chef Mohd Zamri Bin Jemintan has managed to execute a very refined dining experience for Malay cuisine. Food price is above the norm but if you take into account the effort preparation of authenticity, quality and its classy ambience, Songket is set out to define an exceptional dining experience for everyone. With a gorgeous view of our nation’s pride and joy, Twin Towers as a backdrop, who could resist dining here?